Being pregnant has definitely changed my sniffer. I am SO sensitive to scents and smells that it is seriously off the charts! I can only wash my hair in Aveda which is natural, because I swore I could smell chemicals or weird perfumes in other shampoos all day long in my hair. I am fine at work using my normal shampoo, conditioner, and styling aids on clients, even hair color does not bother me, it was just smelling it all in my own hair. Weird! I order all of my Aveda here because they give you free shipping all the time! I also had to stop using my skincare that I get from my esthetician because of the same thing as my shampoos. I swore I could smell chemicals. I did some pecking around online and came up with this Neutrogena Naturals line and have enjoyed it since. The smell is soft and pleasant. I am oily/combination so I switch off between the purifying and fresh cleansing + makeup remover. For my body, my sweet client gave me a few jars of the basq. This stuff is amazing in the shower and was love at first use. It is a soft scrub to help buff away your dead skin and has shea butter and oils in it to leave you smooth and moisturized. Then when I get out, I turn to coconut oil. The use of coconut oil is not anything new for me. However, I do prefer it in the warmer months as it gives you a glow. Who wants to glow white in the winter ;) I mix the coconut oil and palmers cocoa butter in my hand together and rub them all over my body. Did you have any weird smell issues while pregnant? Or not pregnant? I do have a super strong sense of smell naturally, maybe that is why it is so enhanced while pregnant?!! I've had smell issues with my pregnancy too! When I was working (now i'm on early maternity leave) I could smell clients come in with perfume and it would make me queasy. However beauty products are different. 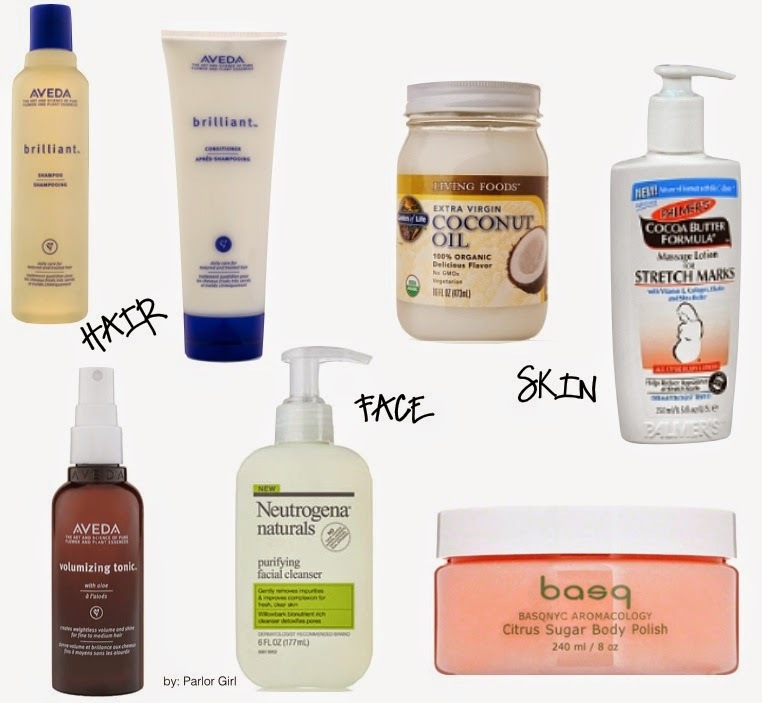 I use a lot of simple lotions and face wash which I used even before I was pregnant (have not needed to switch). I've never been a big perfume person so some smells from perfumes have always got me queasy…now it's just stronger!